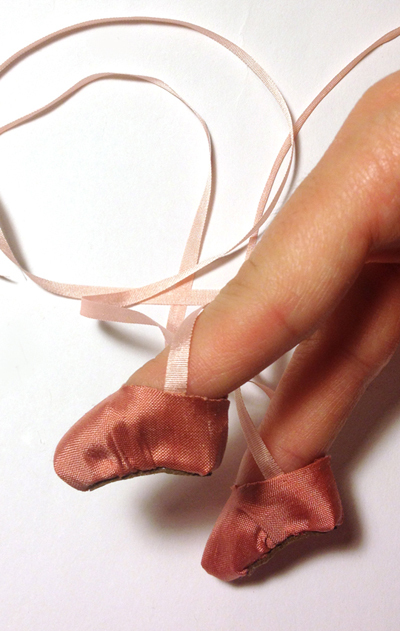 Recently I had the opportunity to create two tiny pairs of shoes for a television commercial. The challenge behind the project was that the shoes were to be worn on human fingers. Here is the commercial that resulted and the techniques I followed to create the shoes. Most of the shoes featured in the spots are factory made doll shoes that were readily available through online purchase. There were two special pairs of shoes however, that could not be found. The creators needed a pair of roller skates and a pair of ballet pointe slippers. With my background in designing doll shoes, this is where I came in :). The challenge behind the roller skates was that the creators could only find plastic skates in the right scale. Because all the other shoes featured were fabric, the plastic would have looked out of place. But we also had a bit of a time crunch—I had just a few days to complete the shoes and then ship them overnight to California. To create the roller skates, I began with an existing pair of plastic doll skates. This is where I got the wheels and base, so I didn’t need to create them. I used a sharp blade to cut most of the plastic upper away from the wheeled portion. I then used the same lace up boot pattern featured in my tiny doll shoes tutorial to create the upper, making only slight adjustments. I laced the skates with elastic so the upper would easily stretch over the model’s fingers. The ballet slippers were a bit more of a challenge. There were no existing shoes or patterns that could be modified for a human finger. So, I created one. 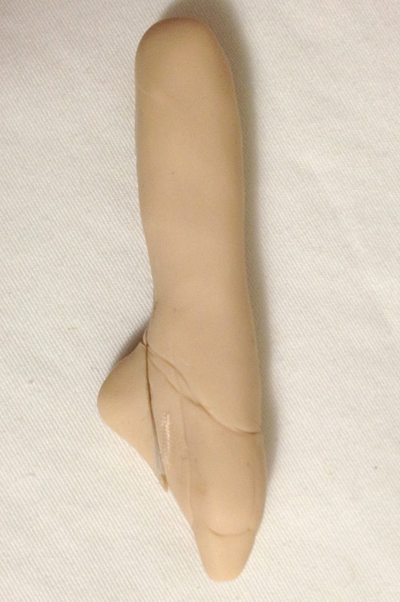 I began by sculpting a finger out of polymer clay. I included the average space and height of a fingernail so the nail would be mostly covered by the slipper. I then sculpted on a heel and toe box shapes that extended beyond the finger base. Now I had a last form to build the slippers over. But there was a slight problem. The sharp curve of the slipper meant that the opening was much smaller than the shape of the fabric upper, so once I wrapped and glued the fabric around the sculpted last, I would not be able to slide the slipper back off. To remedy this issue, I cut the heel section off the last, and taped it back into place giving me a break away heel that would help shape the slipper as needed, but then separate to allow the slipper to slide off. If time would have allowed, I definitely would have created more finger shoes for the project, but I am glad I was able to complete the two pairs in time! And now I can add television prop maker to my doll making history :).